My name is Larissa. My surname is Glatskova. I was born in Irkutsk, on the 24th of December. Such a present for Christmas! As for my age I'm on my half-way of the life. I have much behind and even more in front, I suppose. The best age to work and to create. I have got a family. The children (I have got two children) are not two young. They are great helpers, we are good friends. I like them very much. My daughter - Mariya - 17. She is a student of Musical College. My son - Denis is 12 years old. He is at the 7th Grade of school # 44. He likes maths and computer lessons. My husband is a driver at a firm. His name is Alexander. We are a very happy family. In 1980 I graduated from the Irkutsk Institute of Foreign Languages and all these time I work at school. At school # 44 I work with the students of 9-11 Grades and I have got a group of beginners at the Elementary School. The students like to study English. Many of them (I mean those who finished school) chose English as their profession (teachers of English). I'm proud of my students. I have been not in many cities. I visited Moscow, Volgograd, Novorossiysk, Sochy. In 1995 I had a trip to Great Britain with a group of students. It was great. My dream to be in London came true. As for my hobbies, I like to read the books, to listen to the music, to play piano, to take care about my family. I like to spend time in the open air. With our family we often go to Baikal by car. But I like to return to my town Irkutsk, wherever I was... It has a special spirit - spirit of town. This spring I finished computer courses - Using Computers in education of English. I want to thank all people who are involved in the project Global Village. It has changed my life greatly (to the best). So many interesting people around - so much work to do - in History, in English, and so on. It's really - the new way of getting education. To exchange facts and information, to have friends in Russia and America through InterNet. 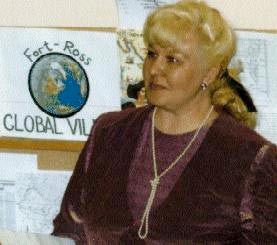 Thanks for 'Global Village - Fort Ross' project.